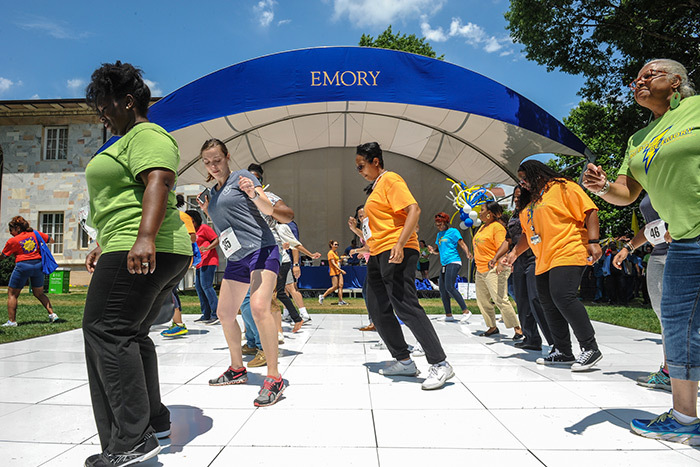 The theme for this year's Staff Fest was “Be Bold – Be Emory,” and thousands of university employees turned out Friday, May 12, to do just that. 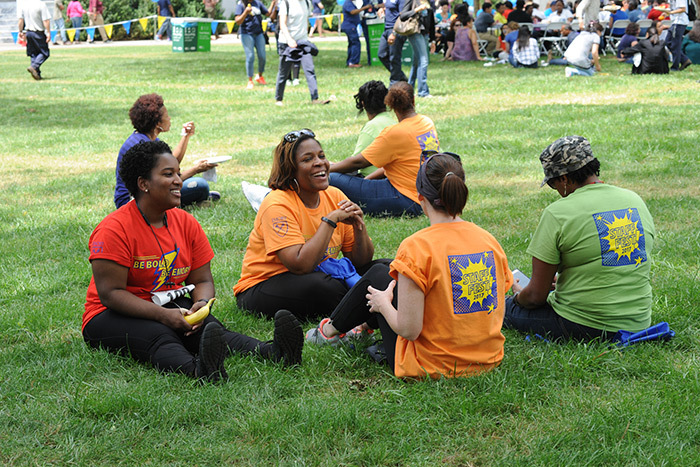 Attendees enjoyed games, music, a catered lunch, a fun run-walk and the popular volleyball tournament. 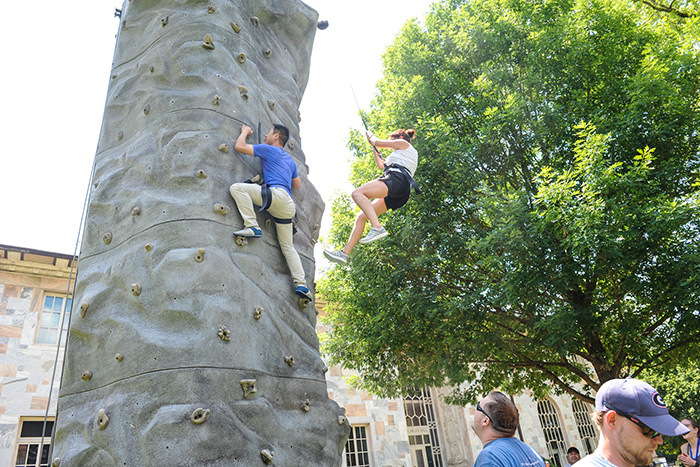 The theme of the 2017 Staff Fest was “Be Bold – Be Emory,” and thousands of university employees turned out to do just that. 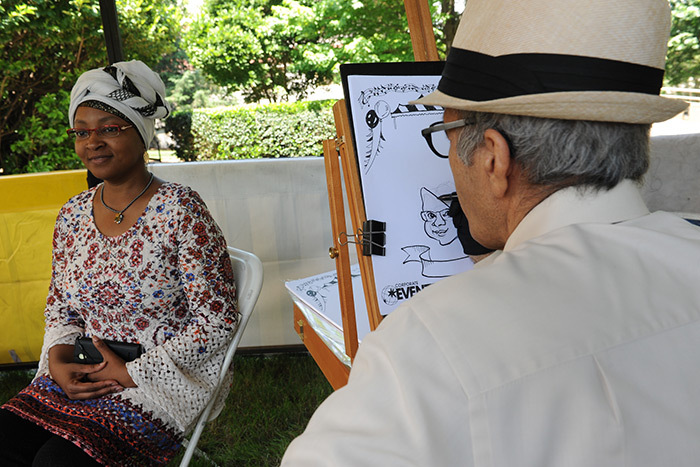 Revelers filled the sun-dappled Emory Quadrangle on Friday, May 12, to enjoy the university’s annual celebration of its employees, drawn by a lively mixture of friendly competition and camaraderie, music and dancing, food and fun. 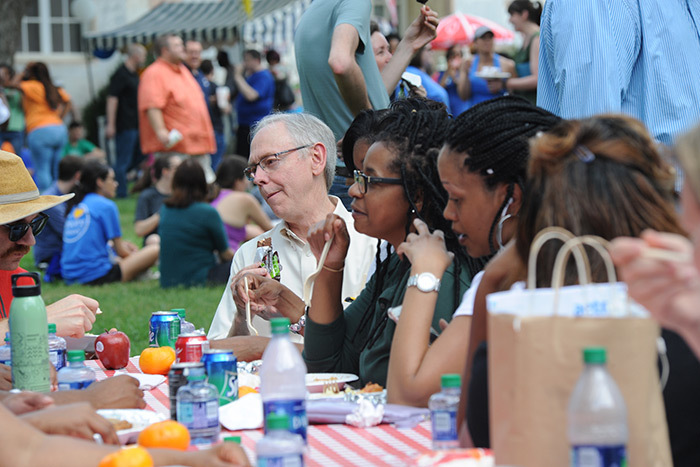 Traditionally scheduled to take place the first Friday after Commencement, the popular campus event unfolds like a congenial mash-up of a family reunion and school field day. 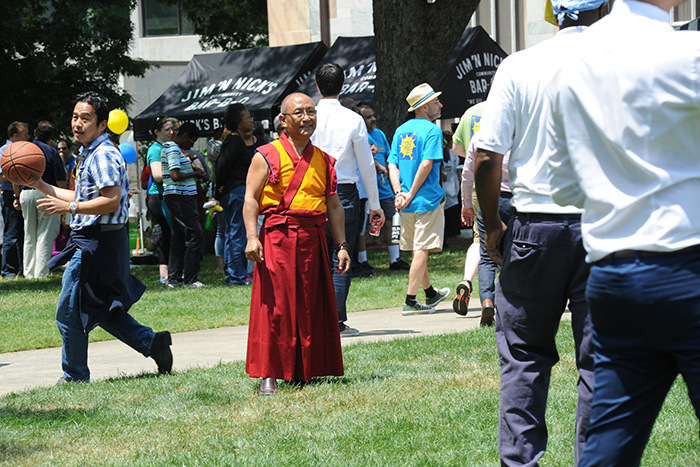 Festivities began at 10:30 a.m. as the annual volleyball tournament got underway on the Quad, followed by the annual Staff Fest Fun Run-Walk, which led participants on a two-mile course that wound through campus and ended on the Quad just in time to line up for a barbecue lunch catered by Jim ‘N Nicks. Caterers prepped to serve 4,200 barbecue lunches to hungry attendees, who could supplement their appetites with ice cream, popcorn and Coca-Cola beverages, which proved popular on the warm, sunny afternoon. But heat didn’t dampen the enthusiasm of the office athletes who turned out for the fierce-but-friendly volleyball tournament, nor the waves of impromptu line dancers who slid and shimmied across the outdoor dance floor. Nydia Charles-Huggins led an enthusiastic group of line dancers from Library & Information Technology Services (LITS) who meet 30 minutes twice a week to dance. “It’s fun, but it’s warm out there,” she laughed. Upbeat music and the smooth, gliding moves drew crowds to watch, cheer and sometimes join in the fun. “I couldn’t help myself,” said Tamicka Reese, an 18-year veteran with the Emory Police Department, who jumped in for a few minutes to bust a move in full uniform. 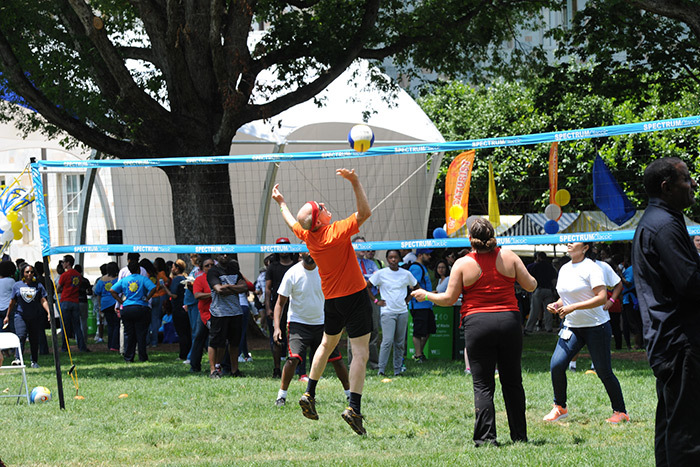 Under sprawling shade trees on the eastern end of the Quad, it was all business, as 18 employee teams met to compete during almost four hours of elimination play on two volleyball courts. Most teams just seemed to be out for a good time. Some had been practicing for a week; some played together for the first time while warming up 15 minutes before their first game. 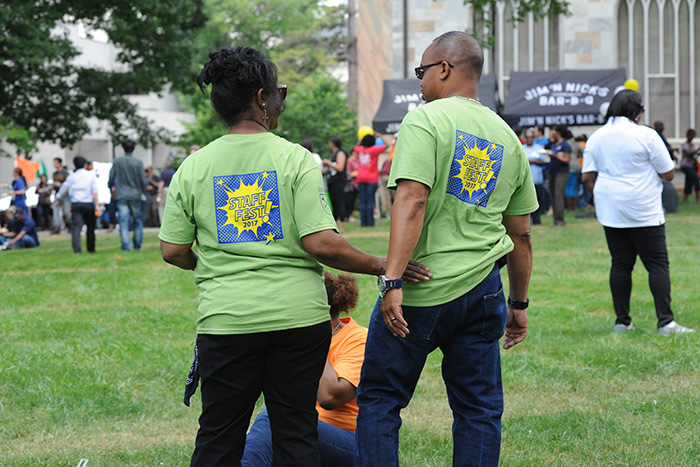 “Every year we field a team and come out here — mostly as a fun, team-building experience — and just hope we get past the second round,” said Nancy Jenkins, senior director of the Research and Administration Services for the Emory School of Medicine. Despite a good showing, #medicineRAS was bested by this year by Zika Stomp, one of two teams fielded by employees from Yerkes National Primate Research Center, who also had a team name inspired by battling malaria, said Elizabeth Ukel, an animal care technician at Yerkes. 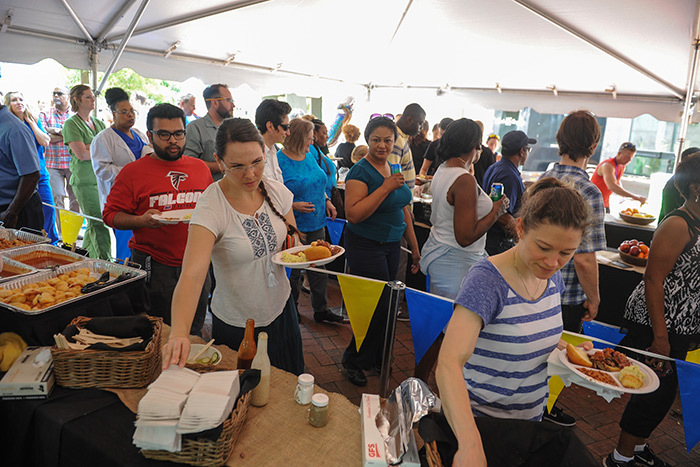 But mostly, it was a day for simply coming together — a place where a white-coated physician from the Winship Cancer Institute, an Emory facilities and maintenance staff member, a professor of religion, and a nurse in pink scrubs could meet and mingle and be reminded for a moment that they were all part of something bigger. After scrambling up a free-standing rock wall, one of many activities offered, Curtis Travers paused to catch his breath and reflect on his first-ever Staff Fest. 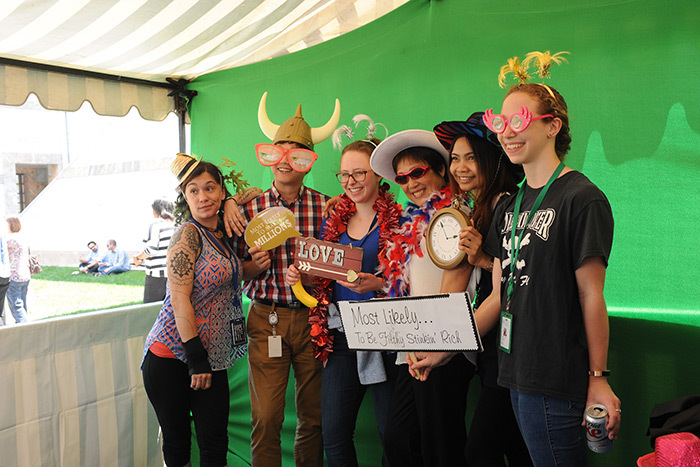 “Although I’ve been here awhile, I decided to come this year for the first time with a group of friends and co-workers,” said Travers, a biostatistician for the School of Medicine who works at the Health Sciences Research Building. “It’s really been fun,” he added, with a grin. The volleyball tournament, a favorite at Staff Fest, drew 18 teams to the Quad for friendly competition. Moving up from third place last year, the tournament champion was the D.A.R. Sentinels, made up of staff members of the Division of Animal Resources in the School of Medicine. Some 180 participants finished with times posted for the Fun Run-Walk, which awarded honors for the top three participants in four age groups for both men and women.